An audience with the Holy Father | Walk with us! Wednesday marked the official start of our visit to Vatican discasteries and councils. Our first order of business was to attend the weekly audience of Pope Benedict XVI. Each Wednesday when the pope is in town a general audience is held for anyone wishing to attend — just as long as they have a ticket (which are free upon request). We were fortunate to receive tickets that placed us on the raised platform and had the opportunity to meet the pope at the conclusion of the hour-and-a half audience. Fr. 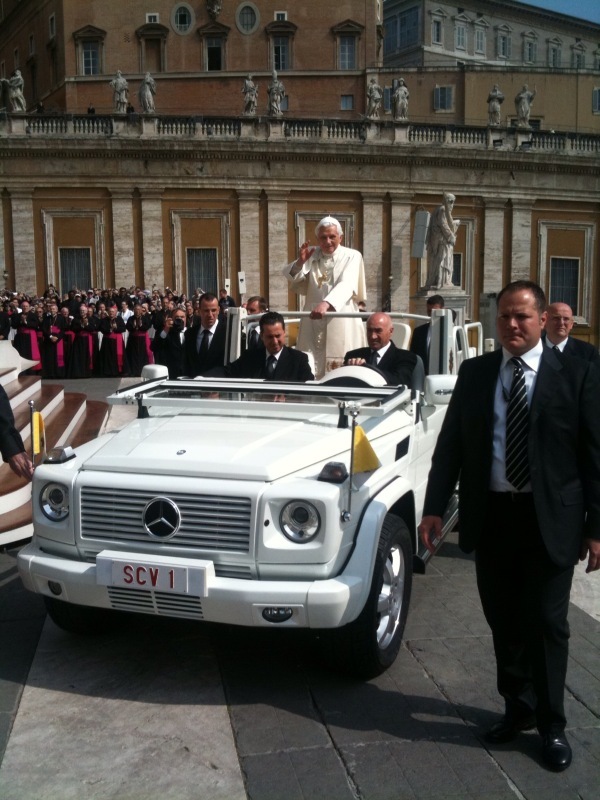 Cassidy was able to snap this photo of Pope Benedict XVI as he made his way to Wednesday's general audience. At the end of the audience, two gentlemen from Singapore joined us and I learned that the man next to me was the ambassador to the Holy See from Singapore. He brought along a gift for Pope Benedict, a beautiful handmade tea pot. He was a very kind man and quite talkative. I told him Singapore is my favorite airport in all the world — and it is! We had just enough time at the conclusion of the audience to walk down Via della Conciliazione for our 12:30 appointment at the Pontifical Council for Inter-Religious Dialogue. This was a joint meeting of LCWR (Leadership Conference of Women Religious) and CMSM (Conference of Major Superiors of Men) with its president, His Eminence Jean-Louis Pierre Cardinal Tauran, JCD. Cardinal Tauran shared with us the scope of the work of this council and its on-going effort to further the efforts of dialogue between religious traditions around the world. Obviously, at this juncture in time the dialogue between Christianity and Islam is very important. Representatives from CMSM and LCWR shared with Cardinal Tauran some of the efforts various religious communities in the United States are making in promoting dialogue. The monastic communities of both men and women have long been involved in religious dialogue, especially with monastic traditions of other faiths, such as Buddhism. We left two information packets with Cardinal Tauran. In one of these is included information on Dr. Richard Lux from Sacred Heart School of Theology and plans to honor him as he retires with the establishment of the Lux Center for Catholic-Jewish Studies. I close this on a sad note. Due to the time difference between here and Milwaukee (seven hours) and the busy day that limits how often I can check for e-mail, I just found out this morning of the death of Fr. Michael van der Peet, scj. It did not come as a surprise as I have been kept informed of his failing health due to multiple strokes. I regret that I will not return in time to be present at his funeral. He was a stalwart member of our province having come over from Holland in the 1950s. Many students from our minor seminary in Donaldson, Ind., and our former college in Honesdale, Penn., recall his teaching of French and his love of music. I suppose if you asked him though, the ministry he found most satisfying was as a retreat master and spiritual director. A personal friend of Mother Teresa, Fr. Michael spoke often of her and her influence on his life. Though officially “retired,” he continued to serve the province and church as a spiritual director at Sacred Heart School of Theology; his presence there and in the province will be missed.